Tour de North Oxfordshire SSP 2013! At 6:45am this morning, Carl began his marathon cycle ride around the wilds of North Oxfordshire! 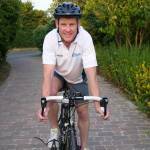 He will be passing all 50 North Oxfordshire School Sport Partnership schools on the 120 mile route.